This publication provides turfgrass management professionals and golf course superintendents in Indiana and throughout the Midwest with information to help them 1) properly identify the black cutworm, 2) understand black cutworm biology, 3) recognize black cutworm damage, and 4) formulate safe and effective black cutworm management strategies. 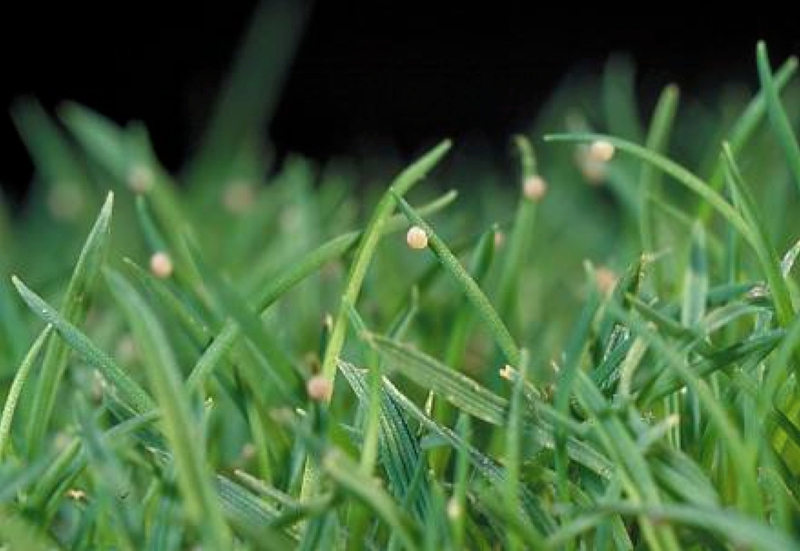 For information on turfgrass identification, weed, disease, and fertility management, visit the Purdue Turfgrass Science Website (https://turf.purdue.edu) or call Purdue Extension (765-494-8491). 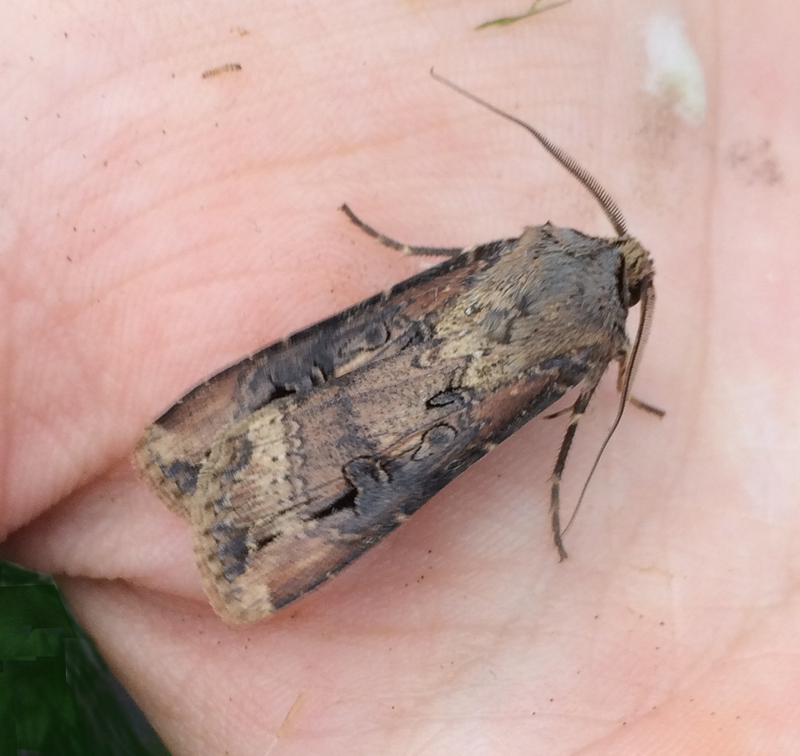 The moth species Agrotis ipsilon is commonly known as the black cutworm, but is sometimes referred to as the Dark sword-grass (larvae) or the Ipsilon dart (adult). The black cutworm’s range encompasses the entire continental United States but varies seasonally, as this species does not tolerate colder temperatures. The black cutworm has four to five generations in the southern-most states, three to four in the transition zone, and 2 to 3 generations in the most northern parts of its range. Larvae are the damaging stage; adults feed only on nectar. The species is a well-known pest of corn, cutting the stalks at the base without consuming the rest of the plant. However, the larvae also feed on turfgrasses, causing notable damage on closely mowed turf. This feeding makes it a common pest of golf course putting greens and tees. The black cutworm moth is a mottled brown. There is a dagger-shaped marking on the adult’s wings (Figure 1). The marking can also be described as a dart below a kidney-shaped spot. The wingspan of the forewing can range between 1.25- 2 inches (32-51mm). The egg is yellow-cream in color. The shell is smooth and bears no visible markings. Egg are attached singly to the tip of a blade of grass (Figure 2). Figure 1. Black cutworm adults have distinctive dagger-shaped markings on each wing. Figure 2. Black cutworm eggs are usually laid singly and toward the tips of grass blades making them easy to remove by mowing. The black cutworm caterpillar’s body appears greengray to almost black, with a lighter gray underside and a broad stripe of lighter gray or brown down the middle of the back (Figure 3). The body is also hairless, excluding a few bristles. The head capsule is dark with a triangle-shaped marking. When full grown, the larva is about 2 inches (50 mm) in length. Figure 3. Black cutworm larvae are green-gray to almost black, with a lighter gray underside and a broad stripe of lighter gray or brown down the middle of the back. Black cutworms overwinter in the southern most states as pupae and adults. Adult moths travel northward from southern states on weather fronts during April and through May. The adults mate upon arrival and begin laying eggs. Eggs are laid singly on the tips of grass blades, but one female can lay as many as 1600 eggs. The eggs hatch into caterpillars a few days later and the caterpillars burrow into the thatch and soil, emerging to feed at night. As the larvae grow, they able to travel into more sensitive turfgrass areas. Larvae generally pupate in late May and emerge as adults by early June. A second generation of larvae appears throughout July and a third generation of larvae are often present through September. Cooler temperatures during October, usually kill remaining adults and pupae. 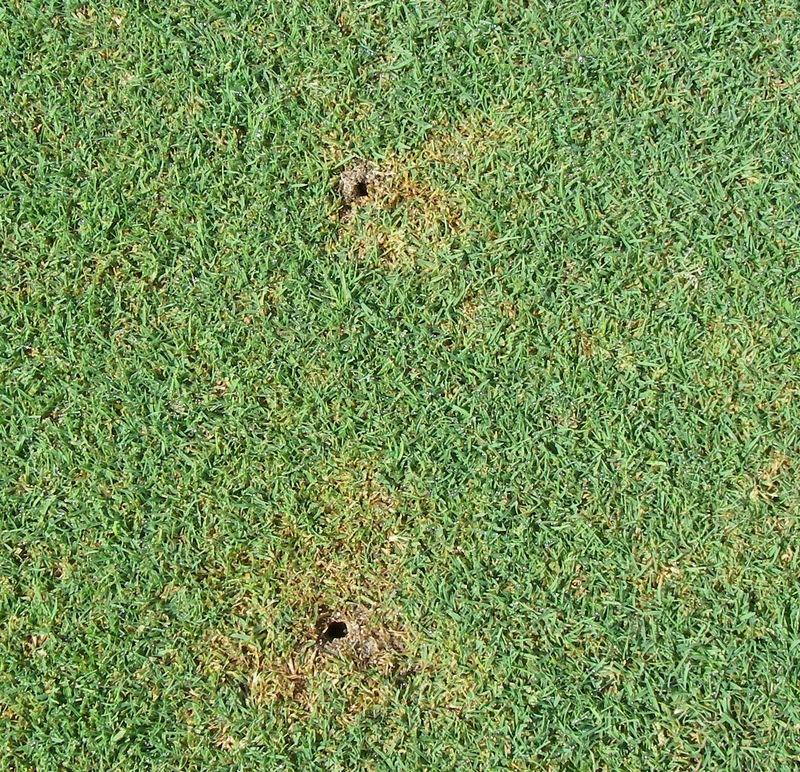 Black cutworm damage can initially be misdiagnosed as a ball marks or other depressions in highly manicured turf. These pockmarks become more irregular as the caterpillar continues to feed. This kind of damage may interfere with play on golf courses and can be unsightly when large numbers of caterpillars are present (Figure 4). Figure 4. Over time, pock marks caused by blackworm larval feeding become more irregular in shape. Black cutworms only come out to feed during the night and generally hide during the day. This feeding behavior means extra effort is needed to find evidence of the caterpillar’s presence before damage occurs. The presence of birds, especially the European starling, foraging on turf can indicate the presence of black cutworms or other caterpillars like sod webworms. Birds will leave probe marks when searching for cutworm pupae or larvae in the grass. Tufts of loose grass around probe markings can indicate where birds have pulled up larvae or pupa from the thatch or soil. A more direct approach to monitoring for black cutworms is to apply a soapy water flushing solution. Adding two tablespoons of liquid detergent to two gallons of water will create a solution that can be applied to one square yard of turf using a watering can. The best detergent for soap flushing is lemon-scented Joy, but Ultra Dawn and Ivory Clear also do not damage turf when used. Avoid using Palmolive. A few minutes after application, larvae irritated by the soap flush will rise to the surface, largest to smallest, and can be collected for identification. Applications should occur in the morning when the larvae are still close to the surface. Turf should be well-irrigated for best results. Soap flushing can also be performed after insecticide applications to assess efficacy. Black cutworm management relies on a combination of cultural, biological, and chemical tools aimed at keeping populations below damaging levels. Although observation of the migrating adults may forecast a potential future problem, only management of the larvae will reduce damage. The primary challenge for turfgrass managers is striking a balance between the functional and aesthetic requirements of the turf and maintaining an environment that is suitable for beneficial organisms and the services they provide. Sound cultural practices that include 1) selection of turfgrass species and cultivars that are well adapted for a specific site or use and 2) proper mowing, fertilization, irrigation, thatch management and cultivation to promote healthy vigorous turf. Such turf is capable of tolerating or quickly recovering from insect feeding and serves as the foundation of “integrated pest management” (IPM). Proper mowing is essential for controlling black cutworms on high maintenance turfgrass. Mowing tees and putting greens every morning removes the majority of the eggs laid the previous night. The clippings should be collected and disposed of accordingly, at a fair distance away from susceptible playing surfaces to avoid re-infestation. Cutworm larvae will also readily inhabit aerification holes, so filling these openings with sand or other top-dressing material soon after aerification may reduce their attractiveness to the larvae. 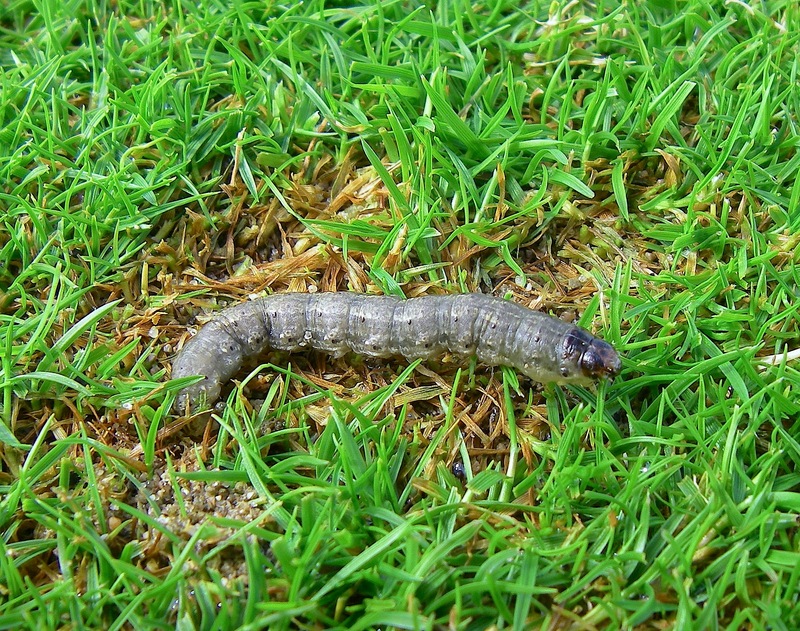 Certain turfgrass varieties play an important role in black cutworm management because they are less likely to suffer damage and recover quickly if damage should occur. When complemented by proper mowing, irrigation, and fertilization, planting resistant varieties can reduce the need for chemical insecticides. The endophyte-enhanced (E+) cultivars of perennial ryegrass, tall fescue, and creeping red fescue provide some resistance to black cutworms. These grasses harbor symbiotic fungi (Neotyphodium spp.). However, the effects of E+ turfgrasses on black cutworm larvae are generally sublethal and have they not been shown to stop black cutworm feeding. Kentucky bluegrass is generally resistant to black cutworm larvae. When planted in Collars, Aprons, and Approaches surrounding more sensitive areas such as putting greens, Kentucky bluegrass may reduce the reservoir of black cutworms that could move onto these sensitive areas when they become larger and more mobile. Although a host of pathogens, predators, and parasites will attack and kill black cutworm larvae, commercially-available biological controls are limited primarily to the insectparasitic nematode Steinernema carpocapsae. When used properly, this nematode can provide good control and is generally safer than chemical insecticides. However, special considerations must be made when using insect-parasitic nematodes. Nematode products should be refrigerated upon arrival and stored as briefly as possible. Nematode viability should be checked prior to application. After mixing, nematodes should be applied immediately. Applications should be made in the evening and irrigation should immediately follow. Screens should be removed from spray nozzles and spray equipment should be pressurized to a maximum of 50 psi. CO2 should not be used to pressurize spray equipment as nematodes may be asphyxiated. Steinernema carpocapsae is available under the trade names Millennium® (BASF), NemAttack™ (Arbico Organics) and others. The black cutworm has several natural enemies and while they are not commercially available, they can assist in management. Ants will attack any caterpillars they come across, but are killed by insecticides in the organophosphate class. Tachinid flies will lay their eggs on caterpillars, where their larvae will hatch and then excavate the host’s body. As mentioned previously, birds eat black cutworm caterpillars, but cause minor damage by pulling up turf in the process. The baculovirus virus (AgipMNPV) infects and kills black cutworms by liquefying them without any danger to humans or wildlife. The virus can be spread through ingestion, mating, and egg-laying. However, outbreaks usually only occur in high population densities which is contradictory to IPM. Finally, two species of entomophagous fungi, Beauveria bassiana and Metarhizium anisopliae can also infect larvae, but they may not perform well on turf treated with fungicides. A curative strategy is the most efficient strategy for achieving control of black cutworms using chemical insecticides. This strategy relies on careful monitoring to identify black cutworm larval activity, followed by timely application of an effective insecticide. Black cutworm larvae can be managed with a wide assortment of insecticides and Table 1 provides a list of insecticides recommended for black cutworm management. Black cutworm larvae are typically exposed to the insecticides through both physical contact and ingestion of treated plant material. Applications should ideally be made in the late afternoon or evening, due to the black cutworm’s nocturnal feeding behavior. When liquid materials are used, post-application irrigation should be avoided for 24 hours in order to ensure that the insecticide deposit remains in target zone of the turf canopy and thatch as long as possible. Granular materials should always be lightly irrigated after application to release the active ingredient from the carrier granule. Due to their extended residual activities, some insecticide products may also provide protection against infestations for an extended period after application. When used at appropriate rates, products containing the active ingredients clothianidin, chlorantraniliprole, cyantraniliprole or thiamethoxam may also be useful as part of a preventive strategy. Table 1. Active ingredients of insecticide products recommended for black cutworm control using curative and/or preventive strategies. *Always consult label directions for specific timing and application recommendations. aLabeled only for use on turfgrass grown for sod or seed.